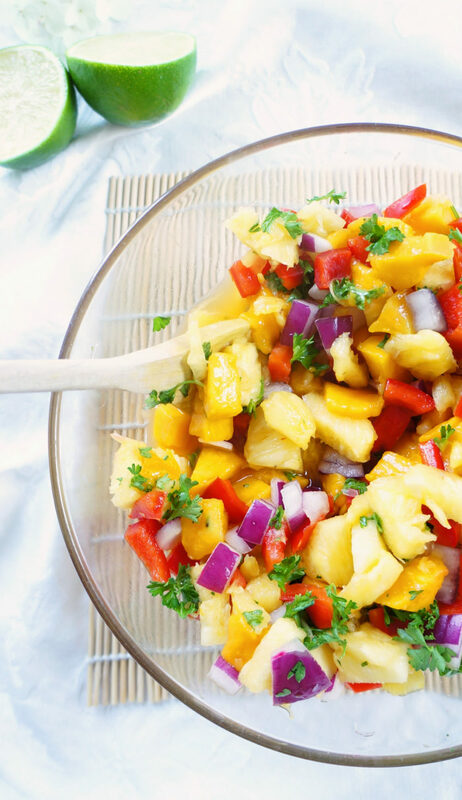 This vibrant and flavourful mango pineapple salsa is the perfect healthy compliment for any chicken or fish dish. You can even dip tortilla chips in it for a sweeter twist on the traditional salsa! 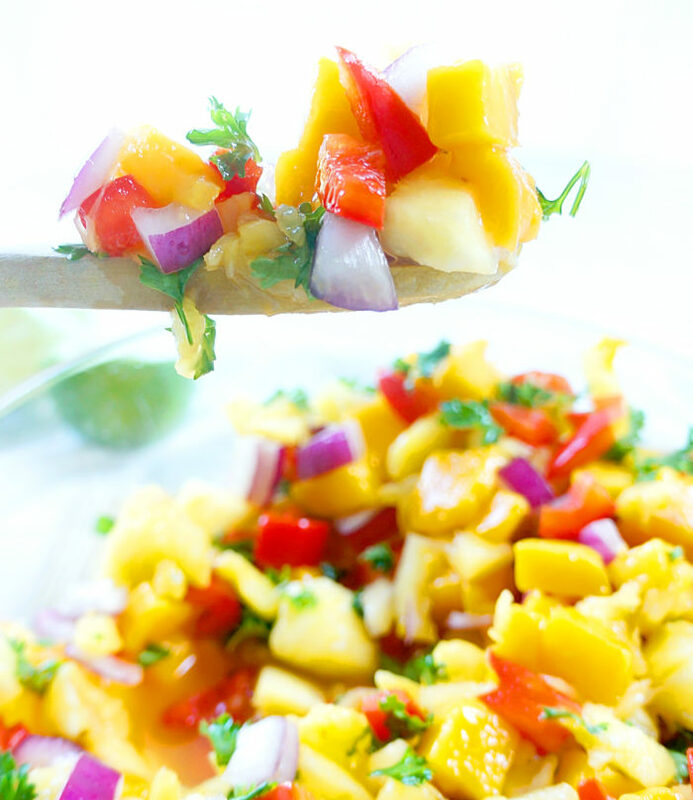 Perfect tropical side dish for a hot summer day! In my last post, I mentioned that I was cooking like crazy this past weekend. Often times, when I’m preparing food, I like to cook according to themes. I just find it’s a lot easier to plan a menu if I know that I have a set theme. Cooking is like planning a party! I LOVE Greek food, so night number once was focused on Greek cuisine. And since, it was boiling hot on Sunday, and it totally reminded me of the Caribbean, I decided to go with a Caribbean theme for night number two. Matt and I whipped up this delicious jerk chicken with coconut rice, which I will be posting shortly. 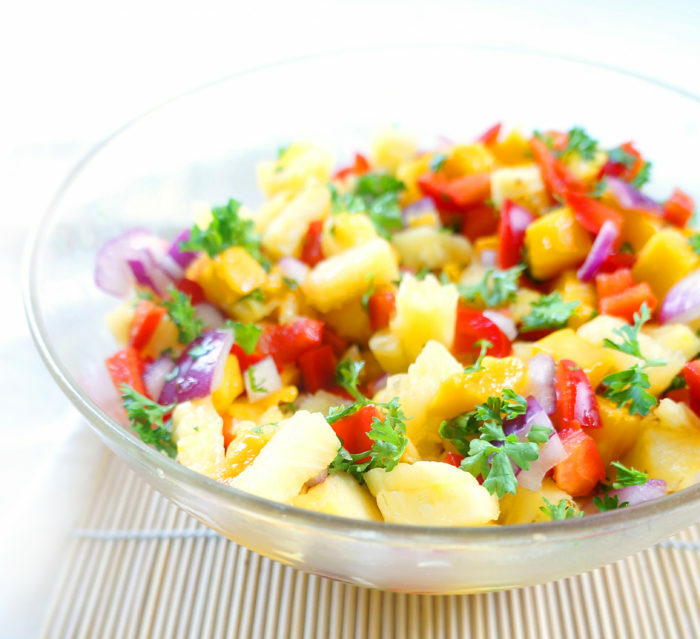 To top it all off, we made this tropical salsa which really brought the meal all together. Not to mention the colours! The colours in this salsa were absolutely gorgeous. And the flavours were so refreshing….and…well..tropical. So many nutrients packed in this salsa too! While it tasted great paired with the jerk chicken, you could really put it with any chicken or fish as a side, or even use it as a salsa dip for tortilla chips. All I know is that it was the perfect salsa for a hot summer day! Combine all ingredients for the salsa in a medium-size bowl. Oh yum! This looks absolutely fabulous! And so tasty! Thanks so much Erin — this salsa is bursting with colour and flavour! I love what you said about cooking being like planning a party. This salsa is totally a party! 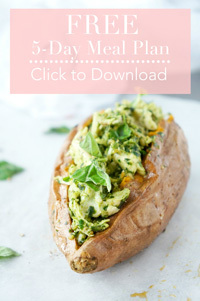 Looks delicious, and I’d love it with some chips and a drank! I always add mango to my salsa, it drives my husband crazy but I love it so much! Pinning! If you love mango, add those mangoes Katalina! Lol…thanks for pinning!